The AppMon Webstart Client is a fully functional AppMon Client that uses the Java Web Start Technology to minimize administrative effort. To access the AppMon Webstart Client, you open a link in a web browser. You don&apos;t install an AppMon Client on the local machine. When the AppMon Server updates, all AppMon Webstart Clients update automatically at start up. The Webstart Client can only connect to a single AppMon Server at a time. 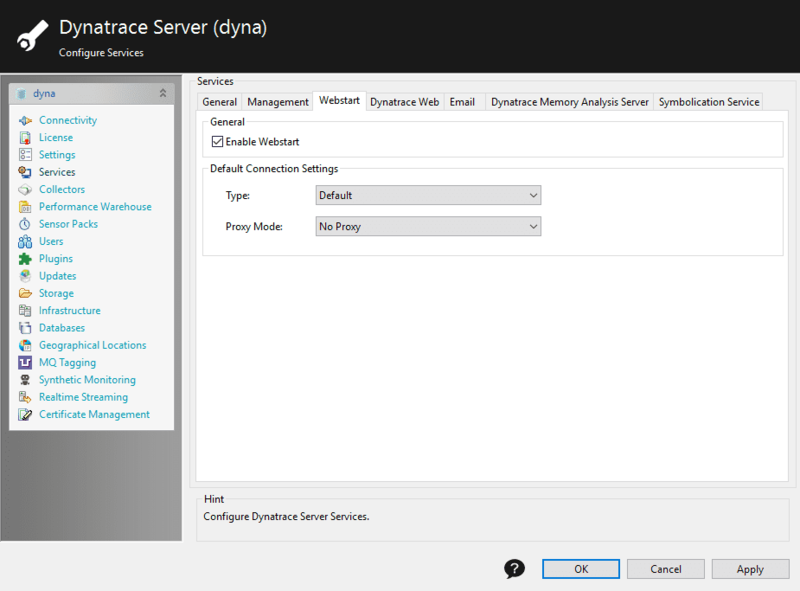 Consequently, the Add Dynatrace Server button does not appear in the Client&apos;s Settings > Dynatrace Client dialog box. By default, the AppMon Server ships with an AppMon Webstart plugin. The AppMon Server uses the plugin to display a download link on the Server home page. The default HTTP settings are at https://<servername>:8021. The link Webstart client references a JNLP file that you need to open with a Java Web Start Launcher. The Java Web Start Launcher downloads all required resources and starts up the Webstart Client. The Java Network Launching Protocol (JNLP) is specified in JSR 056 by the Java Community Process. See system requirements for AppMon 2017 May, AppMon 2018 April or AppMon 2018 October. Open a web browser, navigate to https://<servername>:8021/webstart/Client/client.jnlp. The browser may ask for confirmation to run client.jnlp file. If your browser does not support webstart, you can save the JNLP file, and use it to launch the client. Refer to Java documentation for the detailed instructions. The default installation is pre-configured so the AppMon Webstart Client is immediately available. Enable Webstart: Enables or disables the AppMon Webstart Client. VM Arguments: Shows the JVM arguments used by the AppMon Webstart Client. Due to security restrictions in the Oracle Java Runtime environment this settings cannot be edited. Default Connection Settings: Specifies the default Connectivity settings of AppMon Webstart Clients. 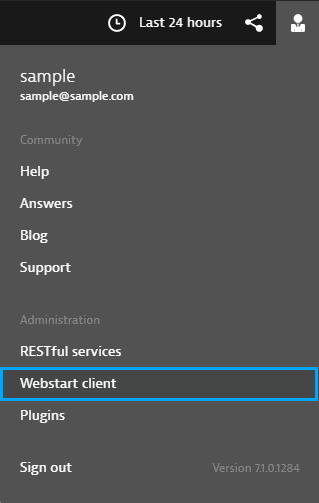 Webstart Client can connect to its host server only. This is the only difference from a locally installed Client, which supports connections to multiple servers. Additionally, configuration files of the Webstart Client are stored in server-based working directories to prevent incompatibility issues. 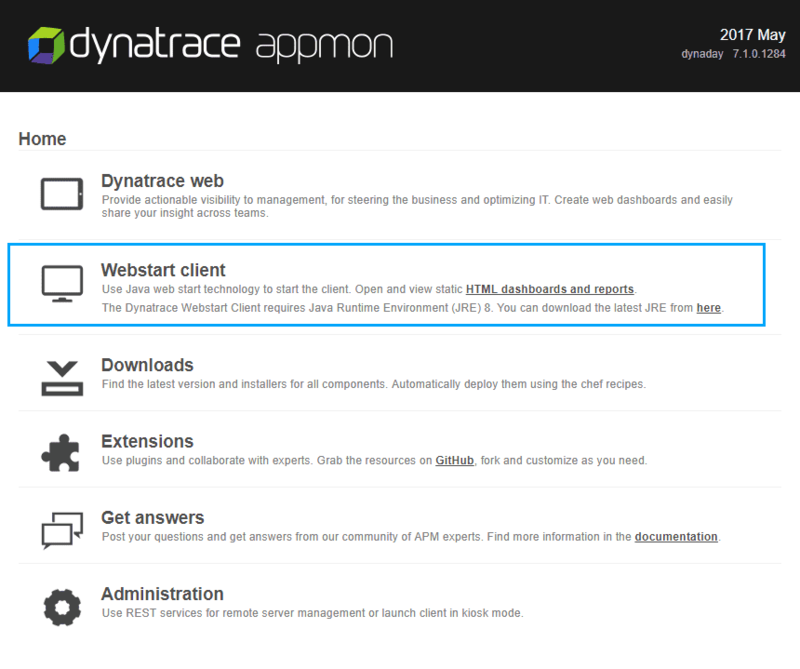 The working directory of Webstart Clients is /.dynaTrace/Dynatrace Webstart Client <servername>. You can find it in the user working directory of your system. Windows: /Users/<username>/.dynaTrace/Dynatrace Webstart Client <servername>. Linux: The main working directory is hidden in /home/<username>/.dynaTrace/Dynatrace Webstart Client <servername> and you must enable hidden system folders to display in your file browser. Run the older AppMon Webstart Client first. Export all necessary AppMon stored sessions. Run the newer AppMon Webstart Client. Import the AppMon stored sessions. Store all necessary dashboards at an AppMon Server. Open dashboards from the AppMon Server. After the basic Webstart URL http://<servername>:8021/webstart/Client/client.jnlp, the query starts with the usual ? and the arguments are separated by &. The space in Incident dashboard is escaped with a + and can also be escaped with %23. Refer to w3schools.com > HTML URL Encoding Reference for a complete table. In the online:// argument, you must use the AppMon Server&apos;s name, which is typically the lowercased host name and not localhost. With the additional argument=-reuse, the dashboard opens in a running Client. The following example only works if you define a PurePath Comparison dashboard and two stored sessions. The & is for argument separation and the source. The compare part uses the same character, and must be escaped with %26. See Client Commandline Arguments and REST Filters for more argument descriptions. Can I launch the Webstart Client even offline when the server is unavailable? On Windows, use the Start menu shortcut that that appears after the first start of the AppMon Webstart Client. Java automatically tries to connect to the AppMon Server to check for updates. If the AppMon Server is not available, the AppMon Client launches the available version. Is it possible to place a Webstart Client shortcut on the desktop? If you have not launched a AppMon Webstart Client, run it now. To open the Java Cache Viewer, run the command javaws -viewer. Select the Webstart Client and click the corresponding button to create a desktop shortcut. How can I remove the Webstart Client from my computer? Open the Java Cache Viewer. To do this, run the command javaws -viewer. Select the Webstart Client and click the corresponding button to remove the application. Can I control where the cache for the webstart files is located, for example if the user-home-drive is located on a shared folder? See the Oracle page for Deployment Configuration File and Properties for more information.